tl;dr; — There's a new ad type coming in the form of dynamic text that will lead users to documentation and courses offered by our clients, and ultimately community-curated canonical questions. .. and not necessarily in that order. It all essentially boils down to the goals and expectations that we set for what should happen when someone views a page on the site, and how close we come to meeting those goals. If you were to define stakeholders here, it would be you (the creators), visitors (the consumers), us (the company) and folks that spend money with us — our clients. As we continue our endeavor to find things that improve our core Q&A experience and contribute to our bottom profit line, we look for intersections where we can make us more valuable to everyone, which often comes in the form of identifying opportunities that we've been wasting because we haven't yet discovered them. No assumptions are safe, but I'm going to wager that most of you have happened upon developer resources made available by companies like Microsoft, Oracle and IBM. You've probably also seen resources where you might train for certifications that these various companies offer. 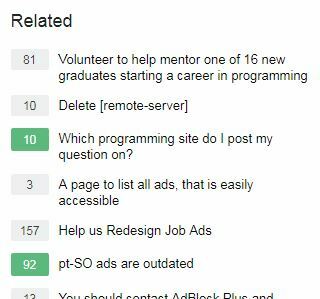 While these companies can also be found directly engaging with programmers by answering questions on Stack Overflow, their big compendiums of stuff remain relatively difficult to surface through a lack of exposure. As we've learned through taking care of Stack Overflow, people often find figuring out what to search for to be difficult. That ad would be something letting you know SQL Server or something related to it existed, but it doesn't really help you with your current endeavor. In fact, the ad does little more than get in the way of what you hope is finally the information you've been looking for. Ever grumble out loud while trying to solve a problem in a hurry? Ever neglect to visit the lavatory until you find the solution, and found yourself exceptionally agitated with unhelpful things? YES, I know you exist, SQL Server! I need to know how to connect to you! Get this out of my fa..
.. and hey, you'd finally know about LEGO: A database driver for LOGO written purely in Objective LOGO. I'll stop. I know; it's getting silly. In other words, getting back to my first paragraph, things go a little bit 'righter' on pages where this sort of magic happens. Now, if you will, imagine the same scenario, but the user is presented with a course (or perhaps even book) that would help them with the initial traction they really needed in order to get their head around the problem. AI magic sees if it can connect the visitor to content that one of our clients would like to get better exposed. If we can understand what the visitor is trying to find, we'll generate one or more ad units in hopes that the user sees them. The content of the page is currently the major contributor to how this is determined. What will these new ads look like? They'll be a sentence describing where a link is going to lead the visitor. It'll be obvious that the link is promoted, the text itself is what will allow the user to judge if the linked resource is relevant to their endeavor. What about community-curated posts and tag wikis? Can we get more attention to them? The current plan is to eventually identify and put 'canonical' FAQ-ish questions in our inventory, and show those when the system has confidence that there's a match. There will be cases where intersections of interest occur, at which point sponsored content will take precedence. We're not yet at a point to contemplate how or (most likely) if competition between sponsors might occur. Where will these new ads be shown? The new ads will respect the reduced advertising privilege. Phew; I had to get that out of the way before anything else. Most of you won't see these unless you're not signed in, at least initially. We're going to try leaderboard placement, as well as placement in the side bar. While we work out what works best, tests might cause these ads to be placed in addition to, or in lieu of others - we're not sure how long it's going to take to iron it out. If you have the reduced advertising privilege, you're most likely to encounter these in the side bar, and then only on pages where we have inventory to show. Just keep in mind that we're testing if you visit the site without being logged in. Because inventory is quite limited, it'll take a little while to see what performs best. We will update all relevant FAQs (including ad product sales literature) as soon as we land on something. When will these be rolled out? We'll begin testing these in at some point this week (beginning 20 May, 2018) with a rather sparse inventory, and then roll them out gradually. Performance metrics (as in server loads and stuff), click rate, interest in general and other things need to be gauged from there before we know more, and that'll take some time. Are these Stack Overflow specific? Yes. While they could conceivably be activated on any site where we currently display ads, they're going to need to soak for quite a while on Stack Overflow. We'll post a broader update on Meta Stack Exchange if it looks like this might be a product offered on other sites. Questions? Please leave an answer and we'll do our best to answer it, but please anticipate a whole lot of "we don't quite know yet" beyond what has been explained in this post, at this point. AI magic sees if it can connect the perceived intent of the visitor to content that one of our clients would like to get better exposed, and if so we generate the ads. It's marked up as promoted, and the link text itself will allow the user to judge if the linked resource is relevant to their endeavor. Please add a feedback option. What if the link text is misleading? What if the linked resource is horrible and not helpful? Essentially these ads will be link-only answers that you get paid for to show them above the accepted answer. Even if marked up as promoted, you (or your clients) want these to be perceived as answers, not as an ad that gets ignored by default subconsciously. We've learned to skip promoted search results. So let us, the community, help make these links more relevant. Your AI needs training. You don't have the resources and domain knowledge to judge the quality of the linked articles. We do: let us vote on promoted answers like on all other answers. If that LOGO database driver doesn't solve the visitors problem, they'll want to downvote it. From my impression Stack Overflow with this addition will look more like all those imitation sites that mimic Stack Overflow's look and feel, with all these suspicious links all over that makes you check five times if you're on the correct page and not mistyped and landed on stuckonoverflow.com or something similar. A sponsored tip from the publisher of the framework/tool used in this question. Make it clear it's an ad, that it's a stackoverflow.com ad and not some ad network generic ad that will secretly lead me to a world of viagra and twenty tabs open if I leave it open for too long. Maybe add a "Why am I seeing this" explanation link as well. From your example this looks quite a bit like native advertisement. Now, you're probably still going to disclose that it is indeed an ad with the little "sponsored content" blurb, but from the rest of the ad, particularly based on what is shown, it seems like you're advoiding the "This is an ad" impression deliberately. That's the purpose of native advertising: tricking users into thinking something is not an ad. If these are placed below questions but above answers, this would indicate deliberate deception to fool users into thinking it's not actually an ad. The small and easy to overlook "sponsored content" snipped on the side supports that view. The power within native advertising, however, is to inhibit a consumers' ad recognition by blending the ad into the native content of the platform, making many consumers unaware they are looking at an ad to begin with. Which measures will Stack Exchange take to make sure its users don't confuse this new form of advertising with genuine content? And how will you balance the interests of your clients wanting their ads to appear as much like regular content as possible with the interest of us users to not be decieved? To clarify, I don't think SE will suddenly start to try and trick us into buying stuff, but I can see this question coming up with how much this looks like native advertisement. These are effectively sponsored (LQ) answers. Stack Overflow is designed to be a repository of information, not a repository of signposts). If the resource is useful, then the sponsor stops paying, what happens? Does that useful resource vanish from the question? If not, what about link rot? If the resource is not useful, then the sponsor stops paying, what happens? Does that useless resource stick to the question forevermore? If these are displayed all around the site, they'll be too generic to be useful. If these are displayed on specific questions, an answer would be more specific, more useful and cheaper for the company. The only place I can think of these being useful would be in the search, and most people only use that for SO-specific technical searches so that wouldn't be very profitable. If SO considers these to be useful, why is their visibility tied to the Reduce Advertisements setting? Is it because they just didn't think this far? Unlikely, but possible; these are humans after all. Is it due to technical constraints? Considering that they're implementing a completely new feature, I doubt adding a preference for it would be that hard by comparison. I suspect that this could be done quite well... but I don't think this is it. It might be useful for sites like MSDN that are full of hidden, arcane knowledge and can only be searched in a very mechanical manner but for most cases this would be better served by an answer bot with answers that can be voted on. which suggests they will be shown indiscriminately on all pages. That's considerably less helpful because the "question that probably doesn't need to be asked" will stick around. It might even attract unnecessary answers from the kind of users who are happy to answer questions that didn't need to be asked. But even if not, if the company stops paying (or just rearranges their website without telling their marketing department), the official sponsored answer will disappear, so the question can't even be a signpost for the documentation. I can see how this benefits the company and "[your] clients", but it seems unlikely to help the visitors, and to provide negative value to "the creators" interested in the long-term usefulness of the site. YES, I F****g know you exist, SQL Server! I need to know how to connect to you! Get this useless crap out of my fa.. This is the same approach Quora took recently (my definition of recently, at least), seamlessly adding in advertisements to their website and web app to lead users into clicking the ad when they otherwise wouldn't have. Can it really be called an advert? I'm not too sure on that one. They searched but didn't find the docs. They found it, but it didn't answer their question. They didn't search at all. If they didn't find the docs through Google's incredibly smart search engine, then maybe it isn't there, or not at all in a way the user is looking for. Or it's just very poorly indexed, but I doubt if a company that is so bad at SEO is going to provide proper input for the AI matching system. Whatever the situation, I doubt if SO's AI would be able to find a match for this case. If it didn't answer their question, neither will it through a sponsored link. If they didn't search, this question is probably useless anyway. The answer is already there in the canonical documentation, and probably in a handful of duplicates as well. The only purpose of this question, is to draw traffic from google to SO, so SO gets a redirect fee, basically stealing the direct traffic to the canonical website and having them pay for it. It's not very different from those price comparison websites that first acquire prime ranking and then let shops pay to have their links on there. The main difference is that those shops will make money of such a redirect, while Microsoft probably won't make or save any money by putting this sponsored content here, unless, maybe, if it would happen to be the exactly correct answer to an otherwise unanswered question, by a user who was just in the decision making process of buying this product they are experimenting with. I wouldn't bet on it. If sponsored content is going to be here, my preference would be to show it to the user while they are typing the question, and basically ask them whether that page answers their question, so it doesn't have to be posted at all. You suggest this will happen. I sincerely hope so. And the same AI could also search for on-site duplicates. In fact, I'd use that to get started, because my current impression is that those possible duplicate suggestions are not very useful most of the time. So if the AI could propose links to other questions that actually cover the question that I'm typing, then I think that could prove that it's smart enough to handle sponsored links as well. Of course that has the disadvantage of having less posts, therefore maybe less traffic, and at least less ad income, but there are advantages as well, like having a cleaner repository with less pollution and moreover less manual labor to keep it so. And who knows, it might become so smart that it can automatically link older related questions together too. If the AI is currently already doing these things, then I have to apologize for not noticing..
With ads you have three choices: your users don't see them, your users subconsciously ignore them, or they piss off your users. Presumably the first two types don't make much money and aren't worth bothering with. Answer-like ads aren't helpful for Q&A unless they're actually treated as answers. My first reaction to the title was "We already have image/animation ads, you want to put text ads there so they take up less bandwidth and have less potential for exploiting Spectre vulnerabilities in our browsers? Sweet!". Then I realised you want to make the ads look like answers. Software companies do not need a separate mechanism for showing users answers to their questions. They can simply answer the questions. They should be subject to the same criteria as any other answers. Then if they're bad answers, people can vote them down, for example. At best, you should copy the text from the page that attempts to solve the problem. Because that is how link-only answers work. At worst, you could have a special exception that answers are allowed to be link-only if they're sponsored. The link can still be voted and commented on. And to be clear - these answer-ads are answers. They may not be stored in the "answers" table in your database, but if they look like answers, smell like answers, and quack like answers, they're answers (and if you don't call them answers then you are out of touch with the domain). If they're in the sidebar or above the question or below the answers, then they are not answers and the stuff I just said about sponsored answers doesn't apply. If they're in between the question and the answers, then they are answers. If the feature is smart enough to detect what users might need, it would be more useful if it linked to what people need and not to what big companies pay you to link to. There is not enough sugar coating in Charlies Chocolate Factory to distract from the fact that ads are evil. A necessary evil, maybe, but still evil. Ads pollute the communication space. Please don't make the site annoying instead of pleasant. At least make sure that ad blockers are still allowed to keep it pleasant. The new ads will respect the reduced advertising privilege. First, an opinion: Nobody using a site likes ads. But companies need revenue too.. so, whatever. It seems like a fairly industry-standard way of monetizing a site. If these ads are to be presented as "Answers", then they need to be permanent for each particular Question. Otherwise confusion could quickly ensue. So either the ads need to be permanent fixtures of the Question (just like an Answer is) and shown to all users, or it needs to be very clear that these are not answers. Suggestion: How about instead of presenting these ads on the Question pages, they are shown above the search results when someone begins to type the title for a question they want to ask? This sounds like Related in the sidebar. I sometimes use that, and sometimes it's useful. I turn to Related in the sidebar when the provided answers don't help or there aren't any answers yet. I can imagine using a new "Related 3rd Party Documentation" section in the sidebar in a similar way. I would not appreciate sponsored documentation links that are embedded within the main content area (questions, answers, and comments). It would be distracting to me considering that I usually arrive at SO through Google because I have an issue (like an idiosyncrasy of a framework that I am trying to work around) which MSDN, bloggers, etc. don't address. To rephrase the last sentence, SO helps me solve problems when I understand the framework/language/foo/bar quite well but have hit a mysterious wall that official documentation just doesn't cover, but a blog post, GitHub issue, or SO answer might. Pointing me to official documentation will only very occasionally help me. So seeing that in the flow of answers will not be appreciated, but having it available in the sidebar would occasionally be helpful. This doesn't make sense as an approach to me. You're talking about training an AI to find relevant information to a question. But SO already tries to find relevant information to a question: it's labeled "Questions that may already have your answer" when you start typing in your question. There's also the related links in the sidebar. If an AI can find relevant content better than these systems, wouldn't it be put to better use finding other questions on SO than finding sponsored documentation that may or may not be relevant? Why not just use it to replace those systems? In other words, if SO can solve the problem at all, why isn't it doing so with its own content? I'm confident there's very little information in documentation that hasn't already found its way into SO somewhere. On the other hand, if the AI won't be better than the frequently useless suggestion box, then how can it possibly find useful content for an off-site resource that it's probably not even scanning the full text of anyway? The pool of useful content is going to necessarily be limited, anyway, since only paid advertisers will be in the pool. This makes it even less likely that the AI can find relevant content at all, even assuming perfect matching capabilities. I just don't see how it could be useful in practice. We're going to try leaderboard placement, as well as placement in the side bar. I believe there is a good reason to have those ads in the side bar, regardless of whether they will also be in the leaderboard: that will ensure users with 200+ rep will occasionally see them, and thus be able to provide feedback. That would mitigate the problem of not showing the ads to the users who are presumably better able to evaluate their usefulness. I like the general idea of having an AI that locates the relevant "official" documentation. That saves me a lot of work, especially when it's not obvious where to go to find said documentation. There's one big glaring problem here. These ads are nothing more than link-only answers. If a user posted the exact same thing, it would get downvoted as not useful. And for good reason. Link rot is a major problem, and SO does a good job at actively avoiding that problem. These ads will likely be the first "answers" that appear for a question since they're posted automatically. If the linked content answers the question, few (if any) "real" answers will be provided, and the poster will have less incentive to come back and accept an answer. Once the link no longer points to the relevant content, that whole question becomes useless. To be honest, one of the big reasons I look for answers on SO is because companies like Microsoft do documentation so poorly. A regular web search shows hits in blog/forum posts that link to the official docs, but those links go stale fast, older documentation goes away once a new version gets released, etc. SO is good at providing the actual content in the answer, so searching here is a much better return on investment. If we start seeing a non-trivial number of questions get successfully answered by these AI-generated link-only answers, the overall value of SO as a resource goes down. A workaround might be to find questions like these, follow the link to the official docs, and then copy/paste the relevant material into an answer. That would likely work for open source projects but for commercial software, might constitute copyright infringement. Even if the answerer takes the time to paraphrase the linked content in their own words and tweak the example code, there may still be a risk. The "referrer" metadata on a HTTP request makes it easy for a company to see which SO questions result in hits to their docs. Can a company come after a user for taking their content and posting a modified version of it on SO where it is distributed under an incompatible license? The bar for fair use vs. infringement is a bit higher when you're posting something immediately below a link to the copyrighted original. Let's be honest here. Most of the books about programming/software development are either copies of other, previously published books (and poor copies for that matter), or simply just not really useful (nice way to put it). I am not saying that book recommendation is bad idea in its nature (I myself would be glad if there were some reliable source for this kind of information), but how do you want to managed that without misleading users into buying some product of low quality? I don't think that user voting will help here that much (see Quora where there are tons of recommendations for books of really low quality) as well as I am afraid that sponsored links will simply be either irrelevant or wasting users' money. I am not really asking for any clarification, but rather pointing out something to think about, because this kind of stuff can degrade any site (even SO). I think there are two very separate ideas here. Seemingly helpful links that are really ads: SO was built to work around sub-par documentation (and ineffective support channels, I guess). Now we're going to have promoted links to that same content SO is supposed to replace. Please clarify how that is meaningful (except as part of your business model, that part I get). Will network sites have the opportunity to enable, configure, and monitor the feature? Will we be able to see which references were shown/recommended to an asker? Will non-ad links be shown to logged-in users (especially newcomers with lots of network rep)? In short, will this be a feature we can use constructively, or will it be just ads with sugar coating? To jump on something others have said, I think linking to quality Open Source project documentation that don't have a budget should be part of this effort. It would raise good will, could encourage improving documentation in OS (funny that SO is OS backwards!? anyone anyone? ), and may even raise SO as a go-to resource (and not just what shows up near the top of Google's results). All related external documentation links could appear in the same box and be seen by all. Links for open source (.NET Core) and closed source (SQL Server) side-by-side with one disclaimer for the entire box. Closed source has a greater incentive to pay you because they are literally trying to sell their product and possibly offset their own support costs by increasing the likelihood that people help themselves through SO presenting high quality answers of all kinds. Open source also benefits and all the free work SO contributors have provided is reciprocated. If SO search worked well, and lead me to good "native" questions and answers, as well as 3rd party docs of all kinds I might even consider Stack Overflow search my first stop for researching programming questions instead of Google. But the limited scope of paying sponsors, and the dubious quality of SO search wouldn't tip me over that edge. I don't want to first use SO Search, fail, and then go use Google. <-- True story: I tried SO search yesterday and ended up Googling to arrive at an SO answer, haha. I will just use Google first. But give me a Chrome browser extension because it really has to be convenient, and a high probability that my question will be, uh, answered, then I'm interested. I think this is a neat idea. Hopefully it is used in coordination with the QA pair's efforts and not in lieu of them. Which is to say, answering a request for a tutorial with a literal link to a tutorial in an ad may be counter productive to the site's overall mechanics. That should be a small edge case though. On the other hand, with 8.8 million users small edge cases really add up. One other route to go with this would also be to see if you can potentially get something going with Amazon to share links to books which were on topic to the QA pair. So it's time for me to speak on ads finally. I must disagree with "there's no way to have ads without expletive your users." I have left reduce ads enabled, and my ad blocker is currently squashing the rest. It's not the ads that are offensive to me, it's the images, and that because they're rendered on the most popular OS settings and always come out hard to read for me. I really don't want to leave something on the screen that's hard to read and brighter than the content. On the other hand, put in text ads and I might even track down why the adblocker is removing them and disable that rule. Stack Overflow exists because companies are, by and large, terrible at providing relevant and useful documentation. In any case, even with the best will in the world, no company can address everyone's edge cases within their documentation. By promoting this documentation over actual answers written to cater to specific questions, that have community endorsement and improvement, you are working against the core mission of the site. You refer to the system as "AI magic". It is not magic. It is a deterministic system that will get things right or wrong in a presumably opaque manner that is under tension from competing constraints. Getting things wrong here - and for some people any advertisement will not be appropriate - will destroy some of the value of the site.